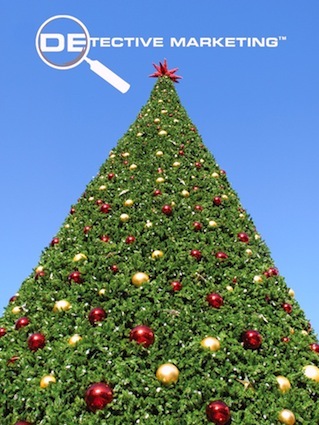 Merry Christmas & Happy New 2013. See you 2013. 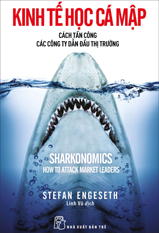 Bite me: Stefan Engeseth’s new book links the behaviour of sharks with the behaviour of successful companies. Simon Young went for a dip. 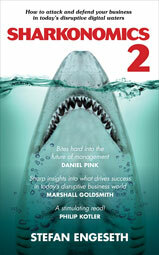 NZ Marketing Magazine (download 2 pages in pdf). Thanks to hero Jack Yan. 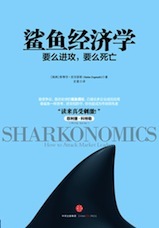 Read this sharp Sharkonomics review from the US tour in Chicago. …nature works @ a higher level than strategy. The problem with reading books & implementing what you read is that they require deep dives into research, which takes a lot of time. When you finally see a sign that there’s a shark behind you, it’s too late to do anything about it & it eats you up. 8. How Sir Tim Berners-Lee invented the World Wide Web by cracking the code: Not invented here! 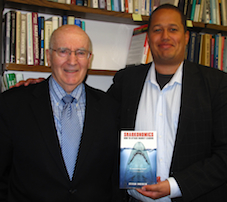 The man, the myth, the legend Philip Kotler met our Stefan in Chicago at The Kellogg School of Management. 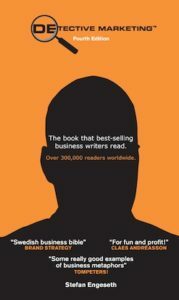 Few people have meant as much to marketing knowledge as Professor Philip Kotler. 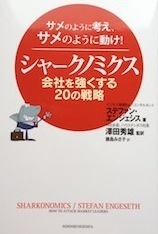 To meet the person gave a legendary memory. Few authors have demonstrated more impressive research than Jim Collins has in his book How the Mighty Fall. It is an honor to have the permission to reprint Mr Collins model The Five Stages of Decline from his mighty book in my book Sharkonomics. Mr Collins reveals in his book How the Mighty Fall such corporations as Bank of America, Motorola, Merck, Disney, IBM, HP and others nearly fell by making the wrong moves. In my opinion these corporations felt as unsinkable as the mighty Titanic which sadly ended up feeding the sharks. 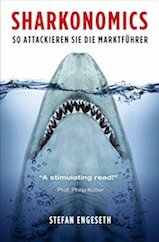 If there had been any readers of Sharkonomics around at that time, when the mighty were stumbling and making the wrong moves, most of them would never have survived. They simply would have ended up like the Titanic, becoming good-to-great-shark food. 1. Hubris born of success. 2. Undisciplined pursuit of more. 3. Denial of risk and peril. 5. Capitulation to irrelevance or death. In my opinion the model looks like a shark’s dorsal fin. A good stage to execute an attack is in stage four. At that stage the mighty prey is weak and out of focus. This is the time for the predator to show its dorsal fin above the surface and spread fear and panic in the organization. When the prey is in denial about its mortality, it will not survive in the “grasping for salvation” stage, and will fall victim to a brutal predator attack. I would argue that most corporations have made a lot of bad moves and nearly been killed themselves in doing so. The only reason why the likes of BP, Toyota, Apple, Microsoft, HD, GM, IBM have survived is due to laziness on the part of their competition! 1. Dive with fleshy friends. 2. Dive below surface to find new opportunities. 3. Team work, like sharing a whale (team workers also taste good). 4. Do less, bite harder (saves energy). 5. Take a test bite (blood in the water is always bad news). 6. Big prey are vulnerable – they underestimate attack from a smaller shark. 7. Bite off the fin (make them sink). 8. Swim together to look bigger and stronger than you actually are. 9. 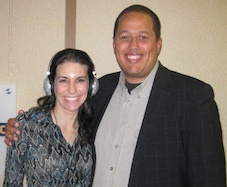 Use social media to find preys and spread buzz. 10. Move faster than your environment. 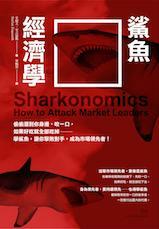 The Sharkonomics list for small business (smaller sharks).